The Atlanta Dream added four new players to their roster on Thursday night during the 2015 WNBA Draft. The Dream selected Iowa point guard Samantha Logic with the 10th pick in the first round. Logic had a prolific career as a Hawkeye, contributing in every facet of the game. The 5-foot-9 guard is the only player in NCAA history to accumulate at least 1,500 points, 900 rebounds, 800 assists and 200 steals in a career. A consensus All-American her senior season, Logic averaged 13.4 points, 7.0 rebounds and 8.1 assists per game while leading the Hawkeyes to the Sweet 16. She was also named the 2015 Senior CLASS Award winner, a Capital One Academic All-American, one of five finalists for the Nancy Lieberman Award and one of 15 players named to the ballot for the John R. Wooden Award. Logic should help out Tiffany Hayes and Shoni Schimmel in the backcourt. Veteran guard Jasmine Thomas struggled last year, and with the selection of Logic, found herself the odd man out. She was traded to Connecticut for the 19th pick in the draft. The Dream would use its second rounder on the sharp shooting Brittany Hrynko out of DePaul. General Manager Angela Taylor said before the draft that the team needed more outside shooting, and they got it in Hrynko. The four-year starter finished her career ranked No. 2 all-time in the Big East in three-point field goals made with 281. Hrynko was named Big East Player of the Year her senior season as she averaged 19.1 points, 5.3 assists and 2.6 steals. 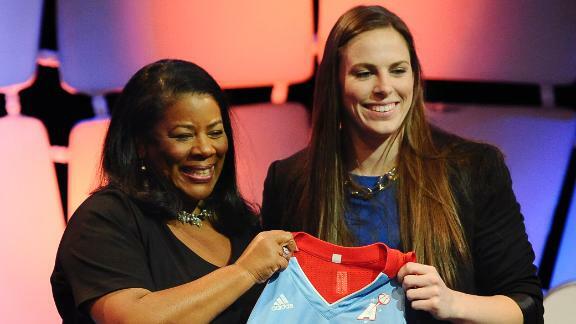 The Atlanta Dream open up their season June 5 at New York. They have made the playoffs in six consecutive seasons and have won the Eastern Conference Championship in 2010, 2011 and 2013. The Dream finished first place in the Eastern Conference during the regular season last year at 19-15, but stumbled down the stretch losing to the Chicago Sky in the first round of the playoffs in three games.